When women shop for accessories, we shop for looks as well as function and fit. A common problem with many IWB and OWB holsters for women is that our tops are typically more form fitting than men’s shirts and women’s jeans tend to ride around the hips rather than the waist. This can make it difficult to effectively conceal a pistol on the waist. A common solution, since many women already carry a purse, is to opt for off-body carry and make the purse their “holster”. There are a number of companies on the market that make purses designed specifically for concealed carry. Features can include a specific pouch or pocket in the purse (or outside the purse) for carrying the weapon. This pocket can be accessible from inside or outside (sometimes both) the main pocket of a purse. Some companies include locking zippers and some even include a cable-lined strap for reinforcement (and to prevent theft). 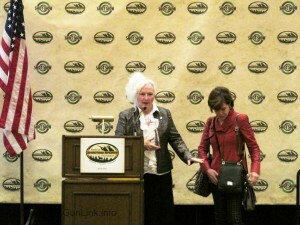 Gun Tote’N Mamas is a woman owned business that specializes in leather designs. There are many styles of purses available – everything from a large tote down to a clutch – in a variety of colors and prints. Price ranges from $65.95 to $279.95. All options come with a holster and all are made of leather. All have an external compartment, accessible by zipper, for the concealed carry of a weapon. Many of models have a Velcro fastening system so that the weapon can be held in the user’s preferred position, cant, etc. Fashion Firearm Handbags is a line of handbags that will likely appeal to younger, fashion-oriented women. The first thing you will notice about this line of purses is the color matching accessories: holsters, wallets, and even pistol cases. These were definitely designed for the concealed-carrier with an eye for this type detail. All purses come with a matching holster that can handle any size handgun and some also include additional matching accessories. Currently, three styles are offered in a few different color options and new designs are in progress. Prices range from $135-$150 for the purses. Matching pistol cases and wallets are around $50. Been and Badge is a joint operation by a fashion designer and a former federal law enforcement officer who was unsatisfied with the options available to her. The weapon is accessible from the top of the bag, which uses magnets to hold it closed. The tote is available in two colors and comes with an adjustable holster (small or large), which can also be used with revolvers or semi-auto pistols. There is also a clutch – available in in three colors – which includes a holster. Price range is $211 to $294, depending on the holster that is chosen. 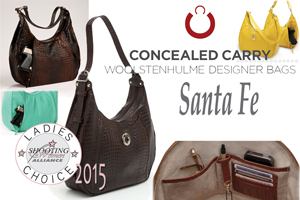 Designer Concealed Carry is widely considered the top of the line in concealed carry purses. These were the first purses on the market to offer locking zippers on the concealed carry compartment. Most of the purses are made of leather and are packed with features inside, including a zipper pocket, three open pockets, key clasp, a place for pens, card slots, and loops for flashlights, pepper spray, extra magazine, etc. All straps are adjustable, cable lined to prevent breaking or cutting, and riveted to the purse. All purses come with an adjustable holster as well. Several styles are offerred and each style has multiple color and pattern options. According to the Shooting Alliance for Women, these are the most desired purses on the market, so some options are hard to find in stock, but they do offer special ordering. With a price range from $229 to $4200 (real crocodile skin purses), these may be a bit on the pricey side, but they are very well constructed and built to last. While these are just a few of the companies offering purpose-built purses for concealed carry, there is another option. If you already own a purse that you love, there is a purse insert, Packin’ Neat, which is the accessory to consider. It is an upright organizer with compartments that can turn any purse into a concealed carry purse. There are three sizes that can accommodate almost any purse and the included is based on the sized of the firearm you want to carry. Inserts are available in two color options and range in price from $79.95 to $92.95. Extra holsters cost $25. There are a multitude of off-body carry solutions available for the fashionable female who doesn’t want to carry IWB or OWB. Many women already carry purse, so this is a simple, elegant solution. While many men want the woman in their lives to carry a weapon to protect themselves, just remember, women are picky about the accessories that they carry. If you are purchasing a CCW-ready purse as a gift, it may be advisable to seek your loved one’s input before picking out something they will carry and be seen with everyday!